When you enter a West Marine store, selecting the best life jacket for your boating activities that can be a daunting challenge. There are a wide variety of life jackets from which to choose—but that’s a good thing because there are a wide variety of types of boating. The Coast Guard requires you to have one life vest of Type I, II, III or V of the correct size for each person on board your boat. This requirement also applies to kayaks and, in most cases, stand up paddle boards. On boats longer than 16', you need to have a throwable device, for example, a cushion, horseshoe, ring buoy or a Lifesling. Type I is typically a large, commercial vest with 22 pounds of buoyancy that’s intended for commercial vessels, not recreational vessels. Type II usually describes the old-style, inexpensive Type II, always orange, with one strap. While these meet Coast Guard requirements, they’re not comfortable, and we would recommend a different type of life jacket. Type III life jackets, like the Medalist vest in the photo below, provide 15 1/2 pounds of buoyancy, with pretty good in-water performance. Their main benefit is the number of styles available, so wakeboarders, kayakers, sailors and boaters who engage in other activities can find a life vest that’s made for their style of boating. You can even find Type III products—float coats—that look like a jacket and are ideal for colder seasons. Type IV: Any boat 16' and longer (except sailboards, racing shells, rowing sculls, racing canoes, and racing kayaks) must also carry one throwable PFD. Type V is a catchall category for life vests that don’t fit into one of the Type I, II or III categories. Automatic inflatable life jackets with a built-in harness are frequently assigned to this category. Although classed as "Type V", many of these offer Type II or Type III performance. Type V life jackets such as these might have just the features you require for your style of boating. PFDs must be Coast Guard Approved, in good and serviceable condition, and the appropriate size for the intended user. The Coast Guard considers a stand-up paddleboard to be a “vessel” when used “beyond the narrow limits of a swimming, surfing or bathing area.” This means that SUPs used outside of the surf zone, are required to carry a Personal Flotation Device (PFD), a whistle (or other sound producing device) and, if out after dark, a white light to give warning to other boaters in the area. In most states, children under age 13 are required to wear a life vest. Type IV Throwable Device. Not to be worn. Select a life jacket that has the features you need for the type of boating or water activity you enjoy. Our selection of life jackets breaks down into eight different classifications: recreational, watersports, day sailing, fishing, offshore sailing, offshore powerboating, paddlesports and commercial. This type is recommended for powerboats or sailboats in relatively calm, warm water, where comfort and freedom of movement are important. 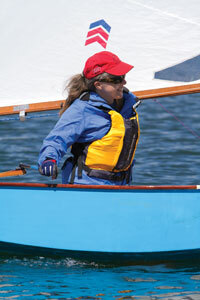 Choose from either a belted or day sailing vest, or an inshore inflatable. The choices are many since this is the most popular type of boating, but demands are not very rigorous. Owners of small powerboats often choose belted vests, which can be adjusted for a comfortable fit depending on the conditions, while sailors will select a more flexible vest or an inflatable. Our Coastal Inflatable Vests with 26lb. of buoyancy are easy to wear, don’t restrict your movement and are available in automatic, manual, and belt pack manual designs. They fit adult boaters over 80lb. with 30" to 52" chest sizes. We also sell a remarkable number of economical Type II vests, but we don’t recommend them as primary PFDs since they are unattractive and uncomfortable to wear. View Type IIs as extra vests for unexpected guests, or consider stocking up with some relatively low-priced Type III vests of different sizes and designs, which tend to fit better and are more likely to be worn. Activities like wakeboarding, water skiing, being towed on an inflatable tube and riding a personal watercraft include a risk of hitting the water at high speed. PFDs for watersports must withstand these impacts and stay intact and attached to your body. Belted vests with three or four strong belts encircling your torso work best because they won’t get torn off easily, even when you wipe out at high speed. Look for vests that have Watersports marked on the label, and ensure that they can be adjusted to a snug fit. Type III Medalist Vest offers a minimum 15lb. buoyancy for adults. Life jacket buoyancy can be used to right this El Toro in the event of a capsize. Small boat sailing requires freedom of movement and flexibility, yet a good PFD has to fit snugly and hug the upper body. The preferred style has a zippered closure and is made from soft, pliable foam. To increase the vest’s flexibility, thin strips of foam are inserted into “channels” so the foam wraps comfortably around your chest. Deep armholes offer additional freedom of movement, but may allow the vest to “ride up” when in the water, so a good, snug fit is important. If you sail a dinghy or beach catamaran your PFD may have to be worn with a trapeze harness, so take the harness with you when you go shopping for a new life jacket. Many customers will find that Day Sailing vests are a good choice for a variety of boating styles except for high-speed watersports. Anglers often like to carry a collection of lures, leaders and other gear, and will appreciate a vest with built-in pockets. They may also operate small and fast boats, which could lead to a high-speed water impact. Therefore, we offer two distinct types of fishing vests; those with pockets that can hold lure boxes, a sandwich or fishing tools, and those with wide encircling belts. The second style is similar to watersports PFDs and can be adjusted to a snug and secure fit, so the vest will stay on during high-speed impacts. Offshore vests provide lots of buoyancy, freedom of movement, and commonly a safety harness that the wearer tethers onto jacklines to stay connected to the boat. In the past, offshore sailors chose between a life jacket and a safety harness, since the two items were seen as interfering with one another. Today’s inflatable life jackets with integrated harnesses provide a high level of safety with one single product. Offshore PFDs are now available with Hammar hydrostatic inflators, so they won’t suddenly inflate due to spray, rain or humidity. West Marine/Mustang Ocean Series vests only inflate when submerged. Decide which type of inflation you prefer (manual or automatic). Virtually all models in the Offshore Sailing category will have similar buoyancy (35lb.) and a harness that complies with ISAF standards. We recommend that offshore powerboaters also have one or two of these vests aboard. You never know when you might need to venture out onto a pitching, slippery deck in rough conditions, perhaps to get the anchor ready or to secure a dinghy that has come loose. Passagemaking requires high buoyancy life jackets designed for rough waters. While the chances of ending up overboard are far lower on a trawler with an enclosed pilothouse, the crew should always wear high buoyancy inflatable life jackets every time they go on deck. If a crewmember goes overboard the time to rescue may be long, the water may be cold and most likely the seas will be rough. Canoeists, kayakers, and whitewater rafters need PFDs that combine freedom of movement and protection. Many specialized life jackets have been developed for niche markets and different styles of paddling, so make sure you try different models that are labeled for paddle sports. But most will offer freedom of movement and freedom from chafe while performing repetitive motions, with large armholes and foam that is distributed away from normal arm movement. Kayakers may need vests with high-cut waists that don’t interfere with a spray skirt. Manually-operated inflatable vests with chest packs are ergonomic and convenient, but require you to slip the inflated bladder over your head. Commercial vessels must have specific types of life jackets onboard to be legal. We offer a range of Type I life jackets and SOLAS-approved models, but we don’t recommend their use on recreational boats. Type I devices are virtually unwearable and they take up valuable storage space. But if you operate a commercial fishing boat that is required to have Type I vests onboard, West Marine has you covered. Below are some other attributes or applications for life jackets that affect their performance requirements. On the Underwriter’s Laboratory label on the inside of all approved vests is a Dynamic Strength Testing value, which used to be called the Impact Rating. This rating describes the strength of the life jacket when subjected to high-speed impacts. However, UL and the Coast Guard are quick to point out that it is unrelated to the injuries that a user might suffer during a high-speed impact; it only measures the resistance of the fabric, belts to failure. Vests with multiple encircling belts are appropriate for high-speed water sports. If you boat in cold climates you should understand the importance of hypothermia protection. Immersion in cold water rapidly reduces your core body temperature, leading to greatly impaired physical and mental capabilities. Even a five-minute immersion in 50-degree water can impair your ability to climb a ladder, catch a line, or tread water. In addition to protective clothing such as exposure coveralls, immersion suits, wetsuits, and float coats, a properly fitted Type III vest also can delay the onset and lessen the effects of hypothermia. High buoyancy vests like offshore inflatables allow the wearer to assume the Heat Escape Lessening Posture (HELP), which can double survival times by reducing heat loss to the water. Crew who have gone overboard may be in the water for a long time and may lose consciousness, either through injury due to hypothermia. In this case, high buoyancy devices like inflatables and Type I vests help retain an open airway. Type II and Type III PFDs lack the flotation and righting force to keep wearers face-up with an unobstructed airway. This distance from the water to your mouth is called freeboard. If knocked unconscious in the water, the added freeboard offered by Type I PFDs may save your life by keeping your airway unobstructed. USCG approved Type III inflatables have to average 3" of freeboard and Type II must average 3 3/4". Infants and small children are hard to keep floating in a face-up position, and sometimes protest when wearing a PFD. Frankly, we think that boating with infants is not a very good idea if there is any likelihood of the baby ending up in the water. As kids get older and more water-savvy they become right at home onboard. There are many choices for well-fitting PFDs that provide stability and buoyancy. Those of us who have had to pull our children out of the drink appreciate behind-the-head flotation collars designed for smaller kids. These come standard with a grab strap and crotch straps. We highly recommend testing the life jacket you select for your child ahead of time in a safe environment, like a pool, to familiarize yourself and your child with the device’s characteristics. Inflatables with harnesses are, by default, Type V life jackets. They come with instructions that you should be familiar with when wearing a harness. Their performance type is generally Type III or Type II. Belt pack inflatables are Type V life jackets with Type III performance because you have to slip the inflated chamber over your head. High buoyancy inflatables (150 N or 33lb. of buoyancy) have a Type III performance rating if they are manually-activated with a ripcord, and a Type II performance rating if they are water-activated. Since the bladder and the rest of the life jacket are identical except for the inflator, once they’re inflated they perform exactly the same. The Coast Guard requires that automatic, water-activated inflatables with non-1F inflators have to be worn to be counted in the vessel’s inventory of life jackets. The most recent models with 1F inflators, so-called “stowables”, don’t have to be worn to be counted as inventory. However, this misses the point of inflatable PFDs, which are so comfortable that you’ll wear them while on the water. Finally, the inshore Coastal Series inflatables use a 25g cylinder, and provide 26lb. of flotation. They are only legal when worn. Always have the federally required safety equipment on board, meaning Coast Guard-approved life jackets. If you select non-approved devices, make sure you back them up with what the law requires. If you have an older, non-approved SOSpenders, Crewfit, or West Marine inflatable, wear it confidently until its useful life is over (around 10 years). If you have life jackets in your inventory that must be worn to be counted, back them up with Coast Guard approved life jackets so you are never caught short and suffer an expensive fine. Establish rules on board your boat defining when life jackets are to be worn and lead by example. Kids 13 years and younger should always wear them, and there would be far fewer boating deaths among adults if they wore them, too.